During World War I it was quite common in Latvia to publish dating ads with an intention to find letter friends. 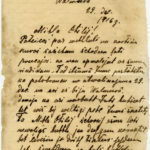 This is one such letter from a Latvian riflemen to his letter friend - a girl named Otilia. In this letter the rifleman expresses his wish to meet Otilia in a couple days. One letter written in hand writing in Latvian. Written on December 26th, 1916.